The Rainbow Loom is by far the most popular. This kit evolved from the prototype which was called Twistz Bandz, which was made of wood, push pins and dental hooks. After the prototype, came the Rainbow Loom. The first production Rainbow Loom kit included the Loom itself, the Loom Tool (which was made entirely of plastic), the Mini Loom, 600 assorted elastics bands, and "C" clips. In the second launching of this product, a metal hook with a plastic handle replaces the all plastic hook from the original kit. The loom itself is made of plastic and has 3 columns of 13 pegs tied together by 3 base units to create a cluster of 39 pegs. The base units can be removed with assist from the Loom Tool, which has a base remover at the end of the handle. Additional loom kits can be combined either beside one another, or end to end to create a larger looming surface.. 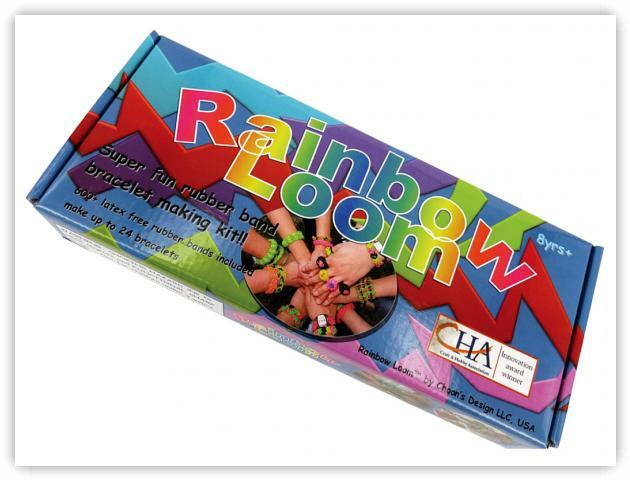 The Rainbow Loom is manufactured in China, but distributed in the US from a factory close to the home of its inventor. There are many retailers selling the Rainbow Loom, with Michael's being one of the bigger distributers.